When people need your type of product or service, do they think of your company or are they calling the competition? Content Marketing can help make you the preferred choice. One question I asked in a recent survey was, “What do you think content marketing is?” Only about 10% gave a reasonably accurate answer, so I thought I’d answer it in this post, in case you are also not sure. When you constantly deliver valuable, non-promotional content, you uniquely position your brand as an authority, as a thought leader, as the expert in your field. People search online for answers and solutions. Creating content with the answers they seek, or the solutions they require gives you the opportunity to show your expertise in specific areas. People trust advertising less and less. Content marketing provides more value and is more readily consumed. Good quality content keeps people reading, so they stay on your site longer or come back for more. They pay more attention to your emails, and engage with your social posts. Consistent action with valuable and relevant content will show that you truly care about your audience. Showing your topic expertise in a variety of media increases your credibility. By being very visible with quality content, people will see you as the authority in your subject area making you stand out from the competition. When you use different forms of useful content in many areas, people will start to recognize your brand and the knowledge you share. When they see your name they’ll want to stop and see what you’re sharing. Over time, with consistent content production, Google will recognize that you are providing valuable content. With proper keywords and some promotion, you can rank higher in search results. By not being salesy all the time, your ideal audience will appreciate your informative content and get to know you better. Keep people reading and they’ll learn more, absorb more, and learn to trust you. Consequently, when they’re ready to buy they’ll think of you. Your email list is your most valuable online asset. If people trust you and know you provide valuable content, they will give you permission to be in their inbox. It’s the ideal place to build and nurture a relationship that can turn prospects into clients, and clients into repeat buyers. Content Marketing is not just blogging, although that’s a pretty effective strategy. And it is not specifically promoting a product or service. 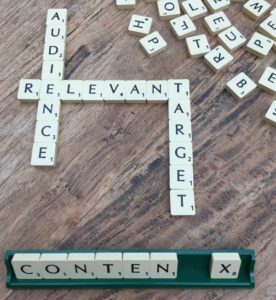 The aim for your content marketing strategy is to showcase your knowledge and build trust. When someone likes your stuff and they are your ideal audience, there is a strong likelihood that they will buy from you. Here are some examples of different types of online content marketing. I’ll bet you’ve seen many. I’ll briefly mention some offline examples because content marketing has been around long before the Internet. Depending on your business, they can also be effective content marketing tactics. In-store giveaways – i.e. recipes, trail guides, etc. Content marketing is a low cost, long term strategy that continually fuels your marketing so you can attract more prospects and buyers. By getting to know you and the value you deliver, they’ll associate your content with the qualities of your brand. If you need help with your content marketing strategy, contact me for a free consultation.